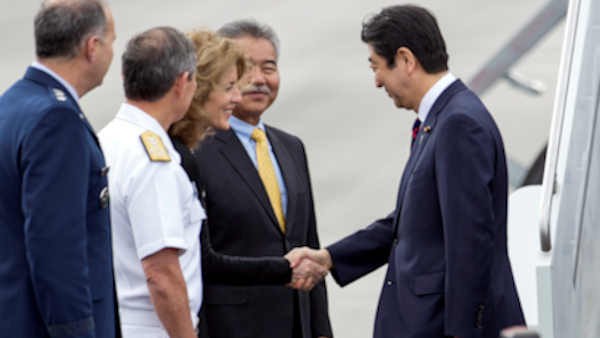 HONOLULU, Hawaii -- In a historic pilgrimage, the leaders of Japan and the United States took to the hallowed waters of Pearl Harbor on Tuesday to prove that even the bitterest enemies can become allies. Prime Minister Shinzo Abe did not apologize, but conceded Japan "must never repeat the horrors of war again." Seventy-five years after Japan's surprise attack sent America marching into World War II, Abe and President Barack Obama peered down at the rusting wreckage of the USS Arizona, clearly visible in the tranquil, teal water. More than 1,000 U.S. war dead remain entombed in the submerged ship, and in a show of respect, Obama and Abe dropped purple petals into the water and stood in silence. "As the prime minister of Japan, I offer my sincere and everlasting condolences to the souls of those who lost their lives here, as well as to the spirits of all the brave men and women whose lives were taken by a war that commenced in this very place," Abe said later at nearby Joint Base Pearl Harbor-Hickam. That was the closest Abe would get to an apology for the attack. And it was enough for Obama, who also declined to apologize seven months ago when he became America's first sitting president to visit Hiroshima, where the U.S. dropped an atomic bomb in a bid to end the war. It was enough, too, for Alfred Rodrigues, a U.S. Navy veteran who survived the attack. The 96-year-old said he had no hard feelings and added, "War is war." "They were doing what they were supposed to do, and we were doing what we were supposed to do," Rodrigues said before the visit. Abe, who became Japan's first leader to visit Pearl Harbor with a U.S. president, said the visit "brought utter silence to me." His remarks capped a day that was carefully choreographed by the U.S. and Japan to show a strong and growing alliance between former foes. They started with a formal meeting at another nearby military base, in what the White House said was likely Obama's last meeting with a foreign leader before leaving office in January. It was a bookend of sorts for the president, who nearly eight years ago invited Abe's predecessor to be the first leader he hosted at the White House. Obama, speaking after he and Abe laid green-and-peach wreaths at the memorial, called the harbor a sacred place and said that "even the deepest wounds of war can give way to friendship and lasting peace." It's a notion Obama tried throughout his presidency to put into practice, as he reached out to former adversaries Iran, Myanmar and Cuba. "As we lay a wreath or toss flowers into waters that still weep, we think of the more than 2,400 American patriots, fathers and husbands, wives and daughters, manning heaven's rails for all eternity," Obama said. Then the two leaders greeted survivors in the crowd. They shook hands and hugged some of the men who fought in the Dec. 7, 1941, battle that President Franklin D. Roosevelt called a "date which will live in infamy." The visit was not without political risk for Abe, given the Japanese people's long, emotional reckoning with their nation's aggression in the war. Though the history books have largely deemed Pearl Harbor a surprise attack, Japan's government still insists it had intended to give prior notice that it was declaring war and failed only because of "bureaucratic bungling." "There's this sense of guilt, if you like, among Japanese, this 'Pearl Harbor syndrome,' that we did something very unfair," said Tamaki Tsukada, a minister in the Embassy of Japan in Washington. He said he believes Abe's visit would "absolve that kind of complex that Japanese people have." Since the war, the U.S. and Japan have built a powerful alliance that both sides say has grown during Obama's tenure, including strengthened military ties. Yet there are questions about whether the relationship will degenerate under President-elect Donald Trump, a possibility neither Obama nor Abe addressed.